Airbus’ revenue for 2018 was €63.7bn (€59.0bn 2017) with EBIT at €5.8bn (€3.2bn). Free Cash Flow stayed constants at €2.9bn (€2.9) and Airbus ended with €13.3bn (€13.4bn) in cash. Commercial Aircraft, which makes 74% of revenue, had 747 net orders and 800 deliveries. The backlog is at 7,577 aircraft. The Helicopter division was flat in revenue (€10.6bn) but increased EBIT margin to 6.4% from 3.9%. Defence and Space increase revenue to €11.1bn (€10.6bn) with EBIT margin of 8.5% (7.7%). Guidance for 2018 for Airbus is 880 to 890 aircraft deliveries with EBIT margin up 15% and Free Cash Flow at €4bn. The closure of the A380 program is, of course, the big news. Airbus booked a wind-down charge of €463m on the 2018 results. CFO Harald Wilhelm said this is the big charge. Smaller adjustments can follow in later years when the effect of the affected 3000-3500 employees is fully known, “but nothing substantial”. The termination was triggered by Emirates wanting to reduce its recent A380 order from 163 to 123 aircraft, instead ordering 30 A350 and 40 A330neo. The reordering of the A350 is noteworthy after Emirates’ cancel of its original order 2014. Adding 40 A330neo is perhaps more significant. 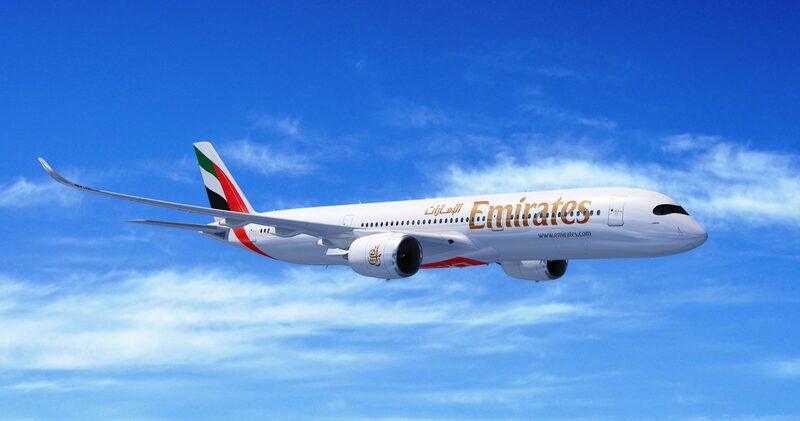 This program has now two large airlines, Delta and Emirates, ordering the aircraft in combination with A350s. It sets a precedent for other airlines shopping for aircraft in the 250 to 350 seat range. The A330neo and A350 obviously complement each other well and the A330neo economics is convincing in its segment. Another highlight was the A350 will go cash positive during the year (as planned) but it was cash positive already 2018 on an aircraft level according to Wilhelm (R&D overhead kept it from the black in 2018). “The A350 program is going very well and is generating margin faster than planned,” said Wilhelm. A320neo deliveries for 2019 will increase to 60 per month by mid-year with 63 per month expected next year. The increase of the A320/321neo fraction for 2018 (which continue 2019) “generates a neo premium on margins” according to Wilhelm. “We could deliver the guided EBIT despite terminating A380 and rebaselining the A400M” (which costed a charge of €436m). Airbus has finished the renegotiation of the A400M program with OCCAM, the customer nations purchase agency. Now follows countrywide ratification of the agreement. It gives Airbus a predictable roadmap both for deliveries and aircraft capabilities. In total, this has cost €1bn but the program losses shall now be under control according to Enders. The Helicopter division has managed to replace the faltering Oil and Gas industry with military orders. Defence and Space sees additional Eurofighter orders from Germany to replace the Tornado as giving a restructured division the expected volume and margins beside a growing Space business. Enders sees a further positive in “arch enemies Dassault and Airbus joining up to get the first studies for the aircraft generation after the Eurofighter”. Funny, how the death of the “new and revolutionary” A380 extendes the life of the good “old” A330. Etihad formally cancelling 40 of their 62 A350 on order. Keeps all -1000, removes all -900. So the A380 is history, sad story. None of them were sucessfull in the market. It was a metodical issue. Sad to see the A380 die, but the twin has won. – the wrong concept. The seats 351 till 500 do sell for less revenue than the seats 1-350. So an B77W will on the same route have more revenue potential, it’s the a businsess administration known as marginal price (from marginal cost, the cost to produce one more seat). In this case, with 300 seats you fullfill the needs of the 300 guys who have the most serious need to fly. And all the others will fly a day later/earlier etc. – they would just book the ticket for a cheaper price if there was more cappactiy available. It’s not that hub 2 hub is not working. Still most long haul is starting at hubs. But It’s rather using twins instead of huge A380 and B748s that can’t be filled in low demand times. I agree, launch the A350NEO and kill the current production. It was never going to amount to anything anyway. Then do a A350-2000 despite the market telling you its very limited up at that end of the size. It certainly would make Boeing happy. Or you could focus on current A350-900 production and get some return, stretch the A321 a bit and start working on the A220 stretch and actually get return on some of that. And keep an eye on the 737RS and have an answer ready for it unlike the 787. There are already rumors RR and Airbus are in talks about the Ultra Fan to power the A350 neo. This would be combined with another stretch. Talks are about 2025, account the usual delay of about 2 year, the A350 is 15 years flying by then. Makes a lot of sense to rework if new engine tech is available, and don’t forget, Airbus is already having experience with the geared fan. Extra stretch of the 350-1000 was said to be built into the changes made between rhe 1000 mk 1 and the 1000 mk 2, so a straight stretch could be such a cheap option even a couple of hundred would pay for it from AB’s perspective. A straight re-engining of what would be a ten year old aircraft isn’t unheard of either, the A330 was re-engined after only 4 years, T-700, turned out to be a smart move. I agree that AB will probaply be focusing on their NB range, but I wouldn’t rule out cheap, from AB’s side, not RR’s, A350 developments. Well the quiet period is over. It also drops the 787-10 orders by 40. That is true, but it had to be part of the calculation to go to 14 a month as well. Firmed or not its still a loss, not a huge impact overall other than the 14 a month having to throttle back maybe. Emirates has not said it does not have enough thrust since the first time. He said everyone should buy A380. Boeing said they met the mission needs. TC is just shifting and shuffling after his lies caught up with him. Now he wants what was there all along. Whats next weeks lie? They should can him and hire Al. Add in the A400 here going to 8 a year. Another A380 with tolerant customers. 8 stretch it out to allow more export orders. Why would anyone order it when you can get a Herc? Phew. C17 cost less and still could not get more orders. The A400 was designed in the same time period as the A380/A350 Mk 1. It has a posiiton above the C-130 with better payload and range but it needs a revised wing for +43ton payloads, slower min speed for heli refuel and a massive cost reduction. Airbus might force the UK and RAF to be launch customers with wing design and production in the UK instead of letting Dassault do the wing design and centralize production in Bremen now at Brexit times. How about the Kawasaki C2? Japan and Kawasaki seem extremely eager to make an international sale. They’d go very low on price. Reduced growth at Airbus, smaller more versatile aircraft covering all range needs surely puts 787 order at risk. Ironic if the net loser turns out to be Boeing ?! The Emirate orders while a loss is not remotely a death knell to Boeing. Airbus is desperate for orders not Boeing! Really OV, come on..you really think 787orders dry up.. Don’t throw your fossil a340 into the mix as well. OV-099 is right. Boeing simply will not sell another 787 in the next 4 years, they are simply doomed. Obviously Boeing is also totally clueless and won’t throttle back if orders don’t come in. Run themselves right off a cliff. Keeping the high production rate is mandatory. They have just started to cut into the deferred cost cookie. .. and the price dumping to make that Hawaiian statement will put pressure on further sales. Since the 787 flies in volume revenue service there was afaics no year where sales came in any way near to deliveries. backlog is continuously contracting. With an annual output of 168 787s per year, Boeing is burning down the backlog in just 4 years. The current backlog for the 787 is 632 units, while it’s 612 units for the A350 — or about the same. Whereas Boeing is planning to deliver 168 787s in 2019, 2020 and 2021, Airbus will only deliver between 105 and 110 A350s annually during the same period. Hence by early 2022 — and barring any new 787 orders — the current 787 backlog would stand at around 130 units; or just over 9 months left of production at the current level of output. In contrast, the backlog of A350 orders would be just short of 300 units by early 2022 — again, barring any further A350 orders — or just short of three years left of production at the current level of output. So, the question is; from which airlines is Boeing counting on getting enough orders in order to sustain the high 787 production output and its current production economies of scale advantage over that of the A350 and A330neo? It’s called the first mover’s advantage. Look at your math. I overproduce, inundate the market, steal your opportunities, because you’re not able to produce right now, when needed. You lose. Like Scott said in an earlier post in the past week, either Airbus raises production on the A350, or they loose market share. The cheap 787 will be there. And now my accounting block looks ever more favorable to wallstreet. I can keep lowering the price. Think Amazon, Google, etc. If there is a space, you need to occupy it first. Don’t look back. Well, Emirates won’t firm the MOU for 40 787-10s and Etihad is set to substantially reduce the number of 787s on order. What could possible go wrong with Boeing’s rather optimistic near term sales prospects for the 787…. I can’t see how a airplane not selling affect B779 order. Just to remember you: they quitted the A380 because there were no more sales. For the 39 cancled A380 from Emirates they orderd 30 A359 and 40 A339. Actually it will likley kill the B78T at Emirates and bears the threat of upgrading some A359 to A35k (harming B77W replacements) or going for A359 ULR and harming B778. It might look like a lost day for Airbus loosing 40 A350 orders from Etihad and 39 A380 orders from Emirates, canceling the program. But Boeing has lost the 40 B78T and will likley suffer cancels from Etihad also – and the B777x has 72% of it’s orders from the gulf. Seeing trouble there is never, never a good sign for Boeing now. So, with airtrafic set to increase year on year, many hubs already at saturation point, when does the vla become a nessesity again? Was the 380 just a show of pride or is it 30 years too early? Its just sad that this project is ending but hopefully onwards and upwards for airbus, i imagine a clean sheet single aisle wont be that far away now that the decks are clear! The Titanic was 30 years too soon. With climate change that iceberg would not have been there. You have your climate change upside down…Greenland glaciers create the icebergs so warmer means …? Titanic was a midget by today’s standards. What many missed is the upgauging starting from the single aisle 50+ seaters upwards. The tech enabled the A321 LR and efficient twin engine planes. Add more seat cramming, and it is/was too early for the VLA need. In hindsight, the trend may have been obvious. It is what it is. But AB had to do it to earn it an equal status to boeing one was or the other reputation-wise. without 911 and the GFC traffic today would be at least twice what it is today. I could make a case that Boeing wanted to leverage the looming GFC to hamper Airbus in sales while sailing the GFC with a full order book. IMU they had a snowballs chance in hell to meet their overambitious timeline. GFC took much customer pressure away from Boeing. Inattentiveness to technical details maimed that plan. At the hubs that I have traveled through frequently in recent years (Atlanta, Salt Lake City, San Francisco, and Seattle), large wide body aircraft operating long range flights are greatly outnumbered by narrow body aircraft operating short and medium range spoke to hub and point to point flights. There are probably at least 5 narrow bodies for every widebody, and even more narrow bodies for every very large widebody. At airports with this type of mix of traffic, if there is a problem with congestion, slots or not enough gates, up gauging the larger number of narrow body aircraft conducting local flights can be just as or more effective in relieving congestion as up gauging the much smaller number of widebody aircraft. For instance, replace 50 seat regional jets with 76 regional jets, replace 76 seat regional jets with A220’s or E190’s, replace 150 or 160 seat MD80’s, MD90’s, A320’s or 737-800’s with 180 seat 737-9’s or 190 seat A321’s, replace 190 seat A321’s or 200 seat 757’s with 225 to 260 seat 797’s. Delta is presently doing all the things that I mentioned in the last sentence, except for the replacing 200 seat narrowbodies with 797’s, which I suspect it will be doing in 5 to 10 years. Here is the narrow vs widebody breakdown of the American, Delta and United fleets, according to my math and the Wikipedia fleet pages for each airline, not including the many hundreds of little bitty regional jets operated by each airline’s regional affiliates. Additionally, it is not unusual for local flights at these airports on busy routes to have 10 to 15 flights a day for each airline, using A320’s and 737’s. A 20% upgauge on this type of route would give a still reasonable 8 to 12 flights per day, wheras there are many international routes operating only one flight a day on each airline using small or medium widebodies, for which it would be difficult to maintain daily service with an upgause to a very large widebody. From day one the A380 wasn’t as efficient as it could have been. It was designed with a stretch in mind (some parts are heavier than they needed to be for the -800). It was larger than made economical sense (hence sky bar and other spacious ideas promoted initially). I think it’s safe to say they could have designed it with 15% less floor space and 20% less fuel burn. It just occurred to me that Emirates and Singapore, the two largest operators of the A380, did not have the option of reducing congestion by upgauging their large narrowbody fleet instead of their widebody fleet, because both are all widebody airlines operating out of small countries and thus didn’t have the huge narrowbody fleets that the US big three have to service domestic traffic. Lufthansa, with the third largest A380 fleet, has a much smaller percentage of narrowbodies in its fleet than the US big three. Perhaps relieving congestion by upgauging the very largest widebodies made the most sense to those airlines with mostly widebody fleets, while relieving congestion by upgauging narrowbodies made more sense to airlines with large narrowbody fleets? Narrow vs. widebody breakdown according to my math and the Wikipedia fleet pages for each airline. Emirates – Narrow 0, Wide 257 (109 A380’s), Narrow/Wide = 0. Singapore – Narrow 0, Wide 122 (19 A380’s), Narrow/Wide = 0. Lufthansa – Narrow 182, Wide 107 (14 A380’s), Narrow/Wide = 1.7. In terms of total number of aircraft, all three of these fleets are less than half the size of United’s fleet, which has the smallest fleet of the US big three with 588 mainline aircraft according to Wikipedia, and less than one-third the size of that of American, which has the largest fleet of the US big three, with 804 mainline aircraft according to Wikipedia. Correction to the last paragraph in my post above. The total mainline fleet numbers that I stated for United and American were the number of narrowbody mainline aircraft for each, instead of the total number of mainline aircraft for each. The paragraph should have read as follows. My corrected version of the last paragraph in my post above was still not correct. I was using Emirates fleet of 257 as the largest of the fleets of Emirates, Singapore, and Lufthansa, whereas Lufthansa with 289 aircraft actually has, according to Wikipedia, the largest fleet of these three airlines. Maybe if I write my calculations out, I can get it correct this time. Here is another try at getting the paragraph correct, maybe the third time well be the charm. In terms of total number of aircraft, all three of these fleets are less than four-tenths the size of United’s fleet, which has the smallest fleet of the US big three with 775 mainline aircraft according to Wikipedia, and less than one-third the size of that of American, which has the largest fleet of the US big three, with 959 mainline aircraft according to Wikipedia. Additionally, the combined fleets of Emirates, Singapore, and Lufthansa, have fewer aircraft than the fleet of United, the smallest of the US big three. Emirates + Singapore + Lufthansa = 257 + 122 + 289 = 668 aircraft. United Fleet = 775 mainline aircraft. Of course, since Emirates, Singapore, and Lufthansa have a greater percentage of widebodies than the US big three, a comparison based on total seats would give less difference in fleet sizes than one based on total number of aircraft; however, my point here is that when you have lots of small aircraft, a modest upgauge of your swarm of small aircraft can do a lot to relieve congestion, but that this doesn’t work for airlines that have not very many small aircraft or none at all. You missed one thing, the fastest growing markets, China and India, are heavily investing in high speed rail, reducing demand for short hail mainline flight, ie. slots. That adds a bit more weight to your arguement. What are the odds that the A380 comes back to life sometime in the future? 20% improvement in the economics is up for grabs — 25% if it can wait for some sort of geared fan. Slot rationing has not gone away and will get worse so the future will generate some hope for it. At some point the BA crush-a-pleb economics will produce a backlash. Up front the space just gets bigger and bigger while up the back perch seats are only an oil price hike away. I would put the odds in number so negative you wind up deeper than the Marrainaes Trench. The single and twin aisle upgauging will dry up the VLA market for a long time to come. If its a 460M Euro charge to wind down, it will be at least a 460M Euro charge to wind back up the day after the line is shot (and much more to reopen as time drags on), and then the 10-20B Euro charge to improve to economics worth ordering. If the economics don’t make it compelling before an additional at least 1B Euro charge, it certainly won’t make it compelling after. So well put and SPOT ON. Oh, btw, IMHO that “crush-a-pleb economics” (and the underlying “value-system” used to justify [rationlize?] BA’s business model and marketing/selling “strategies”) is inherently elitist, and to a large extent is only possible in the current way overconcentrated industry industry where there’s just three (3) remain large network carriers, with each knowing there’s enough demand to only “compete” using an oligopolistic business model defined NOT by who can be the best in class in terms of service delivery and overall customer service value, but the perverse inverse of that now commonly referred to as a “Race to the Bottom” where the airlines “fight” to see whose “products” can be degraded and cheapened the most – and who can then best finagle a way to get away with selling badly degraded, and stripped down “products” that offer considerably less value for the consumers, whom because there already are too few, if any options to choose from (with the remaining oligopolistic only offering “nominally distinguishable ‘differences’” whose true purpose is to blur, confuse, obsfucate, etc., “just enough” to maintain the pretense (fiction?) of “competition” to the extent that it doesn’t invite an unwanted anti-trust investigation that might seek to break apart what otherwise has more than a whiff of a very cozy “club” (cartel?) where the objective is let’s all be only as “different” as we need to be to keep our very exclusive (and exceptionally lucrative) party going where we “win” (and our consumers “lose”) in a game where the only objective of”winning” is to see who can SCREW their passengers “best”/more – and get away with it. …which of course means those TWO, or even THREE, fewer business class seats that used to be six or seven per row in biz class, are then displaced and MUST be repositioned that much further back in the massively LESS DENSE [aka more and more private and even more spacious than before biz class section] – which of course is why 777s and 787s must now be hideously and unconscionably densified that barely a week ago a close friend whom has never, ever brought up the size of their seats or the lack of legroom told me of having been so uncomfortable they wrote the airline to complain! As I’m confident most readers in this industry focused forum know, seldom does the topic of how preposterously narrow and cramped airline seats have become in this era of relentless cabin manipulations [the bedrock of which is extreme “densification”] ever come up with friends whom otherwise have never, ever wanted to talk about when I would mention in passing the subject of seat shrinkage and the dramatically reduced row pitch seen in recent years. So, I’m pretty sure nearly everyone will understand what I mean when I was positively gobsmacked when out of the blue barely a week ago when a close friend told of a flight aboard one of United’s (atrocious flying abominations) new 737s where the seat pitch was so horrible that they described it as feeling like they were crunched in a ball with their knees in their chest! I couldn’t believe my ears! NEVER before had any non-avgeek friend ever discussed seats so horrible and uncomfortable that they then went on to tell me they wrote the airline to complain! Wow! To me that was as if a revelation since it’s practically never that anyone outside of the industry ever brings up a discussion of how narrow and cramped their seats were on a flight they took. And yet, there it was! A litany of complaints heretofore only seen, or heard, discussed in industry focused forums like Brett Snyder’s “Cranky Flier”; Gary Leff’s “View From the Wing”; Jason Rabinowitz’ blog posts/tweets; or one of my personal favorites, Chris Matsczyak’s “Absurdly Driven” commentaries in Inc. The seat was too narrow! The legroom was so ridiculously small it felt as if their knees were in their chest! The seat was too hard! Oh, and the lack of seat-back IFE! So shocking it was a “Well, spank my but and call me darlin’!” moment!!! Of course, just having a total non-avgeek friend “talk shop” with me would be shocking enough. But here’s the thing: this friend is not taller than 5-feet, and they’re thin as a toothpick. 5-feet tall and thin as a rail – they’re saying these seats are too small for them. In any event, when non-avgeek friends start taking about the seats being too damn small THAT’s shocking enough to prick my ears. But, when someone whose super petite friend brings up a discussion about how horribly cramped they felt AND that they complained to the airline, too – that’s just beyond shocking. Boeing, and CEOs at our airlines would be wise to take note that when someone as petite as my friend is complaining that they’re feeling so cramped they’re taking note of it, and complaining about it, that this sadistic and abusive “business model” is nearing the end of its cycle. If you shut down production, no. Tools are scraped, why should demand come up? No, A380 is done, game over. The only thing we know about the future is uncertaity. The Airports lack of expansion and more pax will drive up average seats count. DBX is a special case as Emirates gets its final A380’s and swap out the 777-300ER for 777-9’s and push other operators to DWC then it is full 10-20 years from now. In additon having to make room for the smaller A330neos and A350-900’s. It can maybe be solved with hyperloop to DWC gates but it is uncertain. You might see another Gamma corp. of retired Airbus engineers doing the A380 reengine. AB and BA dominate. The duopoly is very strong. BBD and Embraer are gone. Russians are MIA. Chineese have little chance for 20+ years for a real impact . Russians and chinese are 20y behind in engines… at least. What also strenghtened both companies are the collossal failures of the 787 and 380. In different ways, sure. 787 will be a huge success after being 40b$ in the whole at some point of time..40b$, yet they made it work! The company survived. AB built the 380, an engineering feat that proved to everyone they could do it and make an amazing airplane of that scale. Respect. And go through huge challenges around cracks in wings, etc. But they made it, methodologically, financially (12+B$ net loss), organization-wise. None of the communists, brazilians, canadians, and all those we love as underdogs went through such hazing and still came on top. 787 is a mean, lean machine (plane, production, sales, the whole ecosystem) 350 will be a resounding success for the same reason. The duopoly is here to stay. Game over for a while. Both are prepped for the next build. While Boeing losses were severe, they were not 40 billion. Subtract about 8. No question its still bad but lets keep the numbers accurate. And they are making money and orders match what they need to retire the 23 billion or so that still is hanging out. A380 Costs: I think you are underestimated that. Total program costs had to be 20-25 billion including the wiring debacle and the wing cracks. As they never retired any costs, the whole amount is still out. No program accounting on Airbus side. I stand corrected. Actually it was not a loss but at some point Business Week around the end of 2010?? was saying that BA had 40B$ of outlays INCLUDING the kits on the ground that could not be delivered because the 787 was not yet certified. And this was getting pushed…the endless issues->delays. So not a loss, you are correct. That got to -32B$, it’s well documented. But wow, BA could handle this 40 big ones? Amazing. The whole yearly GDP of 200M people in west africa. And UWE is correct, no accounting shenanigans on that side of the atlantic. ie, the A350 is entirely paid for already… As for the A380, the 12+B$ was the original dev. costs never recovered. Could be much more during the production run. Ivory: No problem, just like to keep the things in the right context, if not it keeps building. Boeing does need to be brought to task, the kicking the programs down the road is a tax avoidance scam. With the profits should go taxes and they are not. As for the A350 being paid for, that again depends on what the secret sauce number was. I am 99,9999% sure its not even close yet. There are XXXX number of aircraft to be made before it begins to replay. On the other hand, if it is successful, If I have this right, they pay a small amount on each aircraft even when the FLA is paid. Ergo the A320 is subsidizing the A380 A330 we do not know about. Its in Airbus interest to call the market so large that they can then make a large number before paying back. Ergo, that is another secret number. A350 did get FLA. Don’t remember how much. Well under a billion if I remember right. Excludes in country tax breaks (aaahm incentives). Boeing gets much larger tax breaks . Its quite a mess. Worse on the Boeing side with less return to the tax payer. By their methodology, some day we will pay them to make an aircraft. I look forward the the responsible and restrained Airbus of the future and not the daytime television quotes of the previous management. I don’t understand how anyone could characterize a company Airbus owned more than 16% of less than three years ago as an arch enemy. We don’t tend to communicate in PC lies. More “sports” in this statement than “relentless warfare to extinction” hidden behind words like “our friends, our allies”. one would expect from US cultural circles. Sad to see technology drop away, but reality and frugality always wins the day. Great news AB have gotten their foot back in the door at EK with both new twin engine frames… As, if successful with EK, the nunbers can be expanded with perhaps the -1000 being used also. Al Baker stated yesterday that AB are launching an increased MTOW a350-1000 next year to give it greater capability (then add the ULR ability) and it could maybe eat into 777 territory. Then a further stretch if needed (I’d do it at the neo’ing) stage and have a 900/1000/1100 a350neo in the medium term. Now… RR… Do not screw up!!! Did you see 25 billion or so benefits on this? Me smells spin like a 15,000 rpm Gyro! Maybe he should go to work for Boeing! 20-25 billion is the program costs after the wiring harness and wing feet crack issues. This makes it all sound so noble. Maybe Enders just didn’t want to own the shutdown earlier in his tenure as CEO when it might have shortened his career. Now that he is riding off into the sunset with a fat purse he can pass out presidential pardons. But a clean system is a nice thing to inherit is it not? Some just take the Golden Parachute and so sad too bad. I see where McNenenry is taking credit for the A380 demise. Too bad he did not own the mess-up of the 787 program while he was crowing. McNerney was the Boeing CEO who seemed to relish the idea that employees would cower under his reign. His legacy, in my humble opinion, is he did not provide adequate management oversight of the 787 program – not surprising given he was not an engineer. Plus he and his overpaid executive team dithered on the NG replacement which cost Boeing market share in the single aisle category. Man we agree on all that. He was a total unmitigated disaster. Concur, but his predecessor, Harry Stonecipher, holds some of the responsibility, too.